Start thinking about proper dental habits as soon as your child is born – yes, before they even have their first tooth! You can get into the habit of cleaning your baby’s gums with a soft washcloth or gauze pad, to remove bacteria from their mouth after feeding. This will set you into a good routine for when teeth start developing, as well as getting your child used to having their gums wiped down and cleaned. It’s also important to be aware of the role of baby bottles in tooth decay. Letting your child fall asleep with a bottle of breast milk, formula or juice can dramatically increase the risk of tooth decay, from high sugar content of the fluids. Always stick to pure water in their bottle at bedtime. On a similar note, pay careful attention to the sugar content of food and drinks as your child grows older and starts consuming solid foods. Each time we ingest sugar, it takes our saliva at least 30 minutes to break it down and neutralise the acid levels in our mouths. Eating or drinking highly sugared food and drinks increases acid levels which lead to bacteria causing tooth decay. As soon as your child turns 2, you can start teaching them about tooth brushing. Let your kids watch you cleaning your own teeth, and get them into a good routine – morning and night. Use fluoride toothpaste and a soft toothbrush and show them how to brush each tooth, and rinse their mouths properly. By the age of 6 kids should be able to brush their teeth by themselves. Flossing can be a bit trickier for them to complete unaided – gently floss between children’s teeth as soon as any 2 teeth touch. 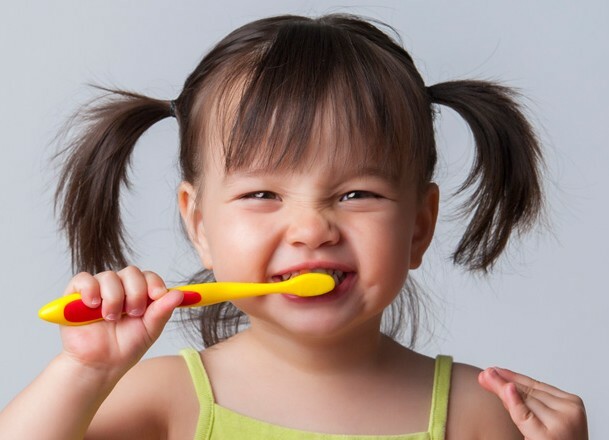 Dentists recommend that children have their first dental check-up before the age of 2, when most of their baby teeth are erupting and any signs of early childhood decay may be present. A good children’s dentist will be able to monitor your child’s dental development, checking for any cavities, decay and gum disease, as well as providing advice for good oral health. Look for a child-friendly dentist in your area that understands the importance of creating a positive dentist experience. You don’t want your kids to associate the dentist with negative experiences, as this can carry through into their adult life causing them to neglect proper dental care. Fluoride treatments are essential for children to develop strong, healthy teeth. Your dentist can apply fluoride and sealants to your child’s teeth to prevent food and plaque from getting stuck and to strengthen tooth enamel against decay. For a dedicated, caring team of child-friendly dentists in Fresno, contact Dr Donan, dentist in Fresno CA. The team will provide a positive experience for your children’s first dentist visits, creating a comfortable and welcoming environment for your little ones. Dr Donan, dentist in Fresno CA, offer gap-free checkups for preschoolers and school aged children, so get in touch to book an appointment.